Right, not that you did it -- just was kind enough to merge in the settings and share. I would have done it myself, not hard, but, really appreciate you taking the time and sharing!!!!!! Thank you! Wasn't hard at all to go through my config.h and update all my specific settings. I'm one of those idiots that likes to stay current on firmware unless there is a massive amount of bugs or caveats. (although I missed that 1.1 just came out the other day, will have to check that out). For me, I wanted 1.0.2 for auto bed leveling. If I change out parts, or knock something on the Z by accident (I'm clumsy), or whatever... I have to do it from scratch, so, it's annoying. I'd rather let it do it itself if I can. Edited 2 time(s). Last edit at 09/23/2015 02:10PM by srcga. Edited 2 time(s). Last edit at 09/23/2015 02:15PM by therippa. X-axis is already on the left (0) my friend, probably the first print I did was the left side X end stop on Thingiverse Was getting annoyed like most others in this thread. I try to take the idiot (meaning me) out of things as much as possible. If all homes are 0/min then I don't have to remember as much and I can have more beer while printing. Not that I'm doing anything revolutionary but I am just getting my setup documented for some friends of mine, I'll share that here too. The more info the merrier. Edited 1 time(s). Last edit at 09/23/2015 05:28PM by therippa. Thanks for posting. Lead screws on the Z are on my list as well.. slowly but surely. How do you like the buildtak? How often do you find yourself re-applying it? I ruined the first sheet of BuildTak by having the print nozzle too close, causing the plastic to permanently bond with it (this was pre-autolevel days). Now with autolevel, everything is fine. I still use purple glue on it, my theory is that the very thin layer of glue helps with separation, so removing pieces is easy. Even with the glue, I can still print at 80C and have no warping issues (like none at all, ever since I started using it and I've been through 3/4 of a roll of filament). I haven't had to replace it yet, and the only place it's starting to show wear is in the front-left homing corner. You need to order a 4k7 resistor and a 10k resistor, some terminal blocks, and a PC817 optocoupler, and wire it as it is in the diagram. 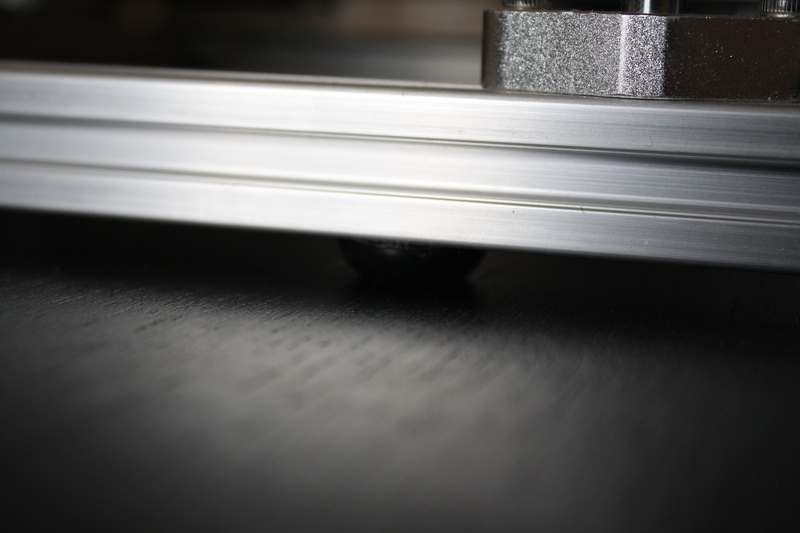 Once you get it all together, you can follow Tom's video on adding autoleveling/autotramming. Edited 3 time(s). Last edit at 09/23/2015 05:44PM by therippa. 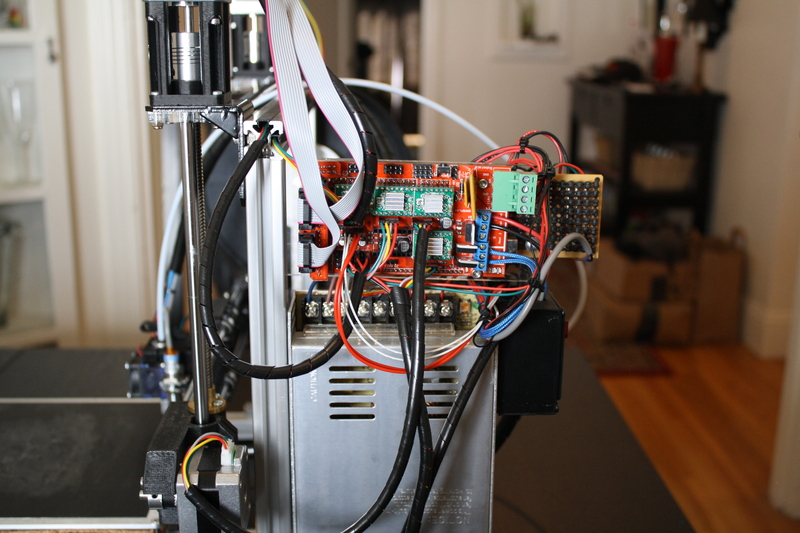 When you guys added the servo for auto-leveling -- what did you have to do with the jumper (VCC?) next to the reset button on the RAMPS? 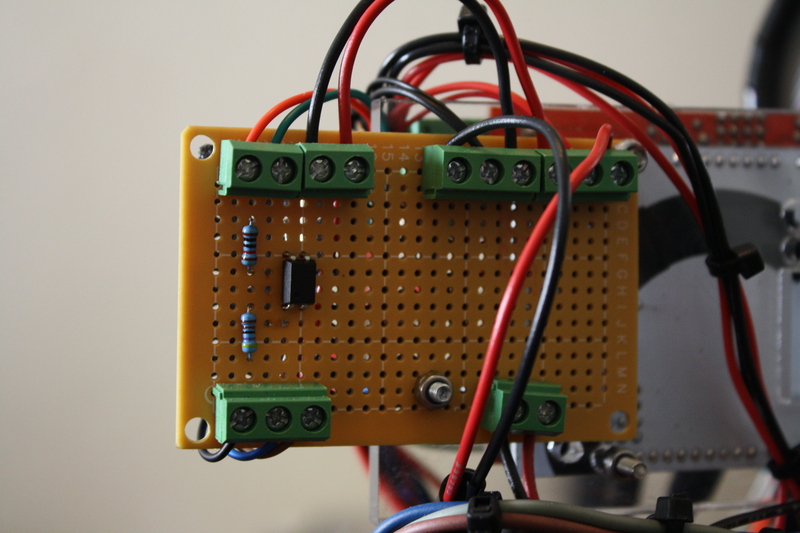 The jumper has to be towards the inside of the board for the servo to power. Although now that I did that, the LCD flickers. Not sure if I have a power supply issue or not.. going to dig into it. Doesn't do it when the USB is connected so seems like a 5v issue. Edited 3 time(s). Last edit at 09/23/2015 06:37PM by srcga. Hello. I have managed to patch my broken thermistor while I await the replacement. I can now get the extruder up to temp and I am working on printing my first object but my extruder motor does not appear to be working. How do I test the extruder motor other than printing something? You can take the fan and heatsink off the front of the extruder and check its turning when you click extrude on the manual control tab of repetier. You have to have the hot end up to temperature to do this. 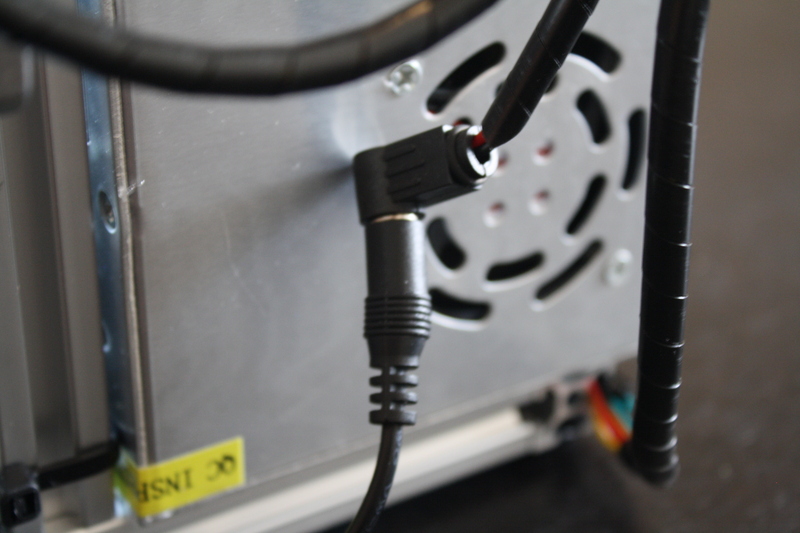 A check you might do first is this: is the nozzle underneath the left or the right hole on the top of the extruder. The Folger instructions show it under the right hand one. Mine was under the left, so I had to feed the filament in the left hand hole and also to reverse the direction of the extruder motor. See [moosteria.blogspot.com]. 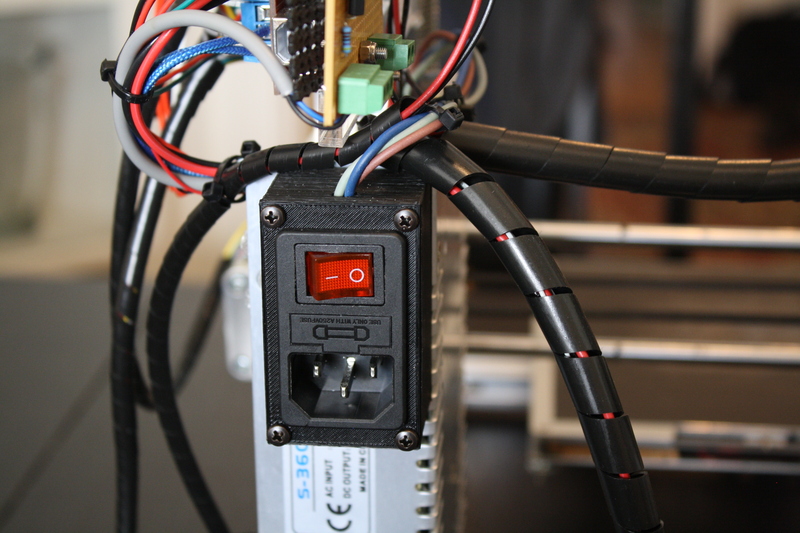 Check to make sure you extruder is turning in the right direction too. Mine was reverseing the filament when I hit extrude. 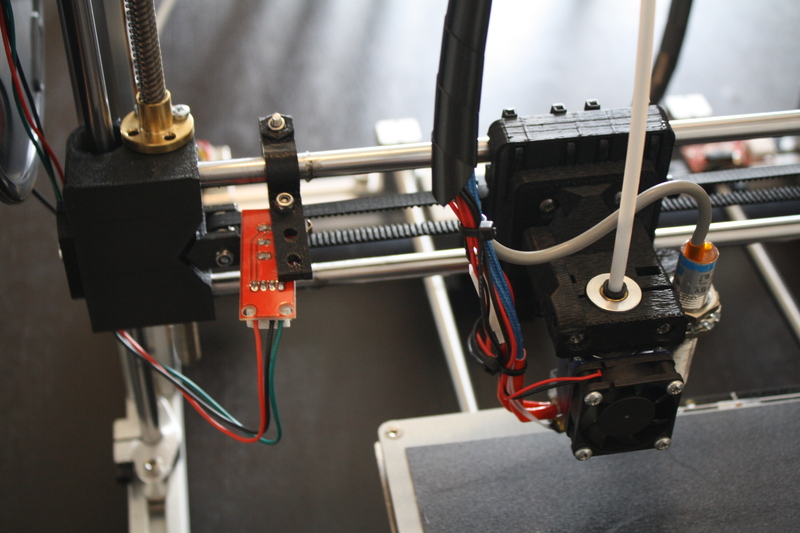 I just rotated my extruder stepper plug wire. 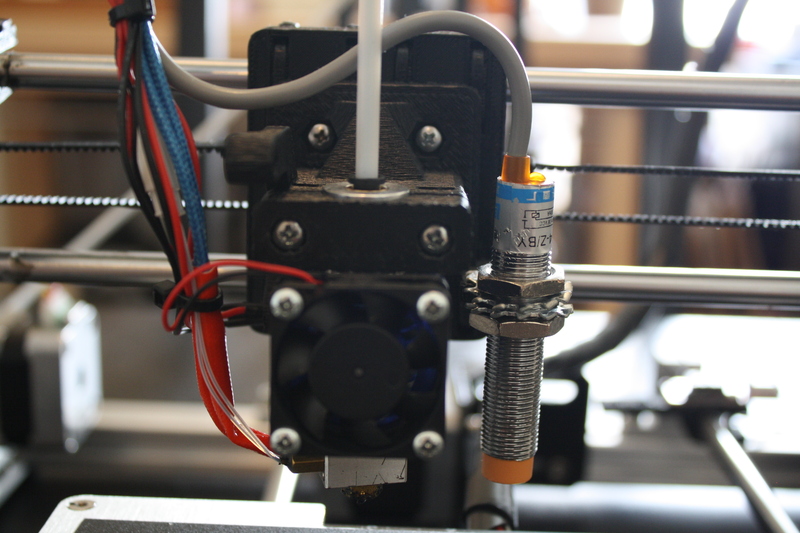 In your software get your extruder up to temp then extrude 50mm . Put your fingers on the filament and see if it is,sucking it in or trying to push it back out of the feed. Edited 1 time(s). Last edit at 09/23/2015 08:41PM by woodknack. Ok thanks, it's feeding the right way now. It feeds for about 200 mm before it gets stuck. I'm guessing I need to adjust the feed/flow rate. What's the difference between the two? Got a link to the crimper and pins or what they are called? I want to shorten those wires too. Picked up a big assortment of connectors when I got black stepper drivers. Why not. Edited 1 time(s). Last edit at 09/23/2015 10:07PM by srcga. 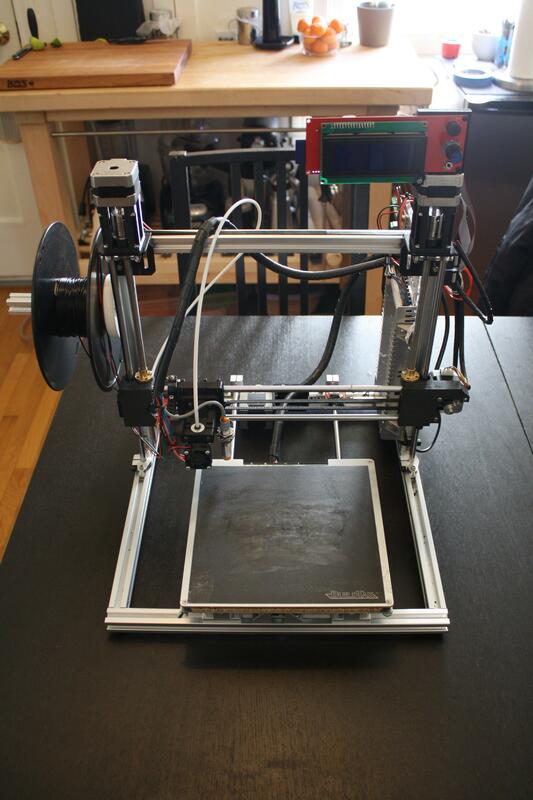 Before you do that first print you must calibrate your extruder. Watch this video. [www.youtube.com] You can input his coding in the Manual section of Repetier. When you input the R1 E100 S90, you'll see that the S90 slides over to the left. Leave it there but make sure when you are typing it in that you put one space in there. Don't ask me why but that's the way it works! Edited 1 time(s). Last edit at 09/23/2015 10:53PM by tjnamtiw. 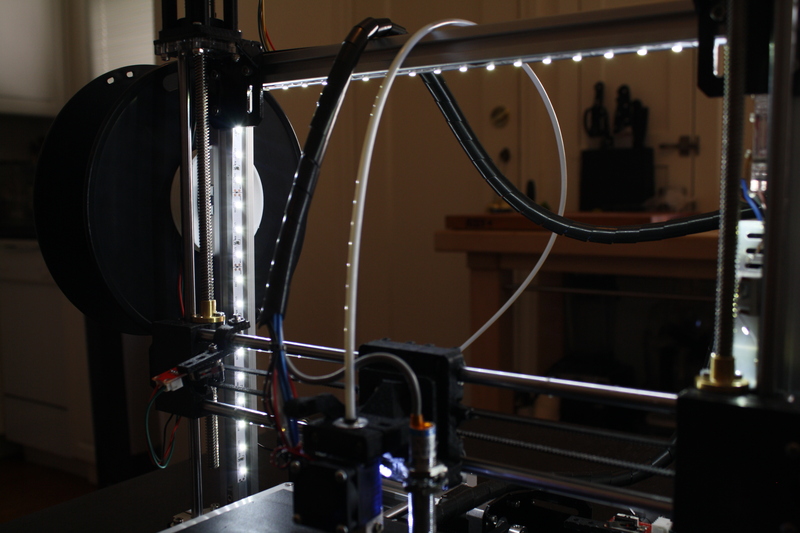 The feedrate is the speed at which the printer prints, and the flowrate is the rate that the filament gets extruded. Edited 1 time(s). Last edit at 09/23/2015 11:20PM by Mach. Edited 1 time(s). Last edit at 09/24/2015 01:14AM by woodknack. I redesigned the bracket for the led light with the switch housing built into the bracket instead of separate. I also beefed up the bracket a little by adding a 12v sign. I'll print it in the morning. Im having as much fun playing around in the cad program as I am printing off the stuff. You really can get your creative side out there with a 3d printer..
New printed bracket. works great! Edited 1 time(s). Last edit at 09/24/2015 12:20PM by woodknack. Thank you very much, I've added this to my project list! therippa, that is a damn fine looking build. Congrats. Anyone have a pic showing how the belt tensioners get installed? Thank you for the belt tensioner pic therippa! I'm on my fifth cube. Starting to look better. Everything is looking really good on my calibration cube after the belt tensioner and extruder calibration. Having a tough time getting the top layer smooth though. It's kind of saggy in places. Is that a temperature issue?